The photo is from a Special, to celebrate the 10th anniversary of ‘Eastenders’. I think it went out in 1995 and was a Pebble Mill Special (they dropped the ‘at One’ bit when they moved it to midday! That year we also did Specials with David Attenborough, to celebrate his 60th and his latest ‘Life’ series ‘Living Planet’, and with Vera Lynn for the 60th anniversary of WWII. All produced by Helena Taylor and AP’d by me. 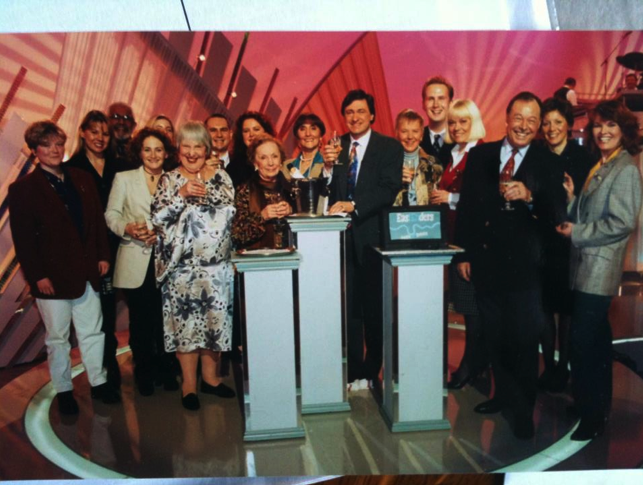 The photo features Pebble Millers (left to right) me, Anya Francis, Melissa Feather (behind Ethel), Nick Harris, Helena Taylor and also Julia Smith the creator of the show (behind Alan Titchmarsh’s left shoulder). We also got the casts of Corrie, Home & Away and Neighbours to record tributes to them too! ‘Having directed over 150 eps of the show I think you’ll find thats the legendary June Brown (Dot)behind Titchy…I think the woman on the far right near Bill Treacher is actress Louise Jameson who played Rosa Di Marco.Also there are Lucy Speed, Wendy Richard, Anna Wing, Gretchen Franklin and Tommy Eytle.’ I’m working on the others! 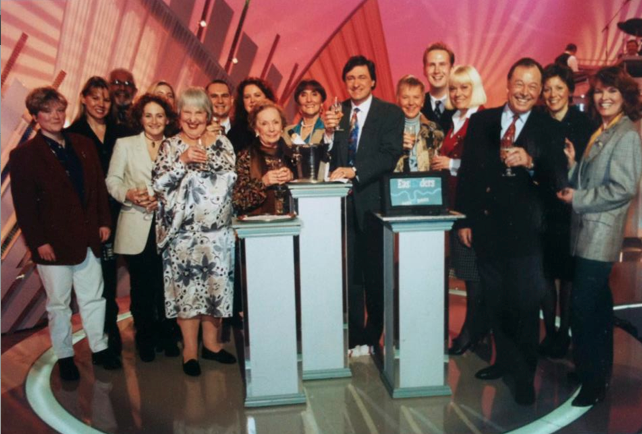 Having directed over 150 eps of the show I think you’ll find thats the legendary June Brown (Dot)behind Titchy…I think the woman on the far right near Bill Treacher is actress Louise Jameson who played Rosa Di Marco.Also there are Lucy Speed, Wendy Richard, Anna Wing, Gretchen Franklin and Tommy Eytle. I’m working on the others!